Accomplished musician Nicolas Notarianni, known to many as “Guitarsnake”, recently released an instrumental album that subtly pushes the limits of musical expression. The Album, titled “Around the World”, is packed with unique phrasings and guitar work that catches the ear, yet doesn’t overwhelm it with mindless shredding. The album comes with nine tracks, and two bonus tracks, along with a full video clip of “Around the World”, which was released as a one minute teaser on YouTube. Although the hit single is boasted as the title of the CD, another noteworthy track is “My Religion Part IV: All about me”. The point is, the single just scratches the surface- you could loop the CD for hours on end, and as cheesy as it may seem, it tells a story. You may feel reluctant when buying an instrumental CD, you may not, and it all depends on your musical standpoint- however this is no ordinary instrumental CD. When you buy this album, you’re not buying a shred-fest with show off-y licks designed to melt your brain; instead, you’re buying an articulate arrangement put together by Guitarsnake with the intent of drawing you in. Another aspect of the CD I’d like to comment on is the ambience, or rather symphonic feel from the other instruments. The last track I’d have included in this review is “On the Road (Remastered)”. This track features a wide variety of contributing musicians such as Roo, Yann Armellino, Victor Lafuente, Olivier Mesnier and more. The song makes the album go out with a bang, a great finish, packed with some licks worth looking up afterwards. 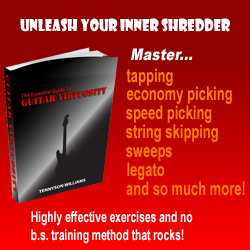 If your influences include Joe Satriani or John Petrucci, then this CD is right for you. It’s clear where Nicholas gets his influences, but he plays uniquely, not sounding too much like either. If you’ve read this far you’re probably already sold, hopefully you’ll enjoy the CD as much as I do. 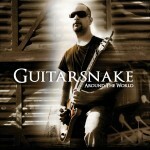 Guitarsnake is a Mad Guitar Records artist and is playing on the up&coming album “Guitar Addiction”. Right on Guitarsnake! I’ve heard this album and it was very good. One of my friends said it has a similar “restraint feel” to my new CD. If you like one you will probably like both.